Refreshments : The Crown (thecrownatmickleton.com, tel. 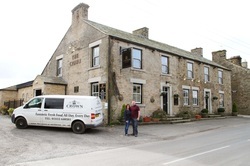 01833 640381) offers bar snacks and meals throughout the day, but opening hours are seasonal so check before setting off (thecrownatmickleton.com, tel. 01833 640381). A range of real ales, wines, soft drinks is also available. You are, however, spoilt for choice on this walk s there are three other pubs within yards of the route ! A little further down the road in Mickleton is The Blacksmiths Alms (tel. 01833 640605), whilst Romaldkirk has two pubs, The Kirk (tel. 01833 652260) and The Rose and Crown (rose-and-crown.co.uk, tel. 01833 650213). Contact the pubs directly for details of opening hours and menus. 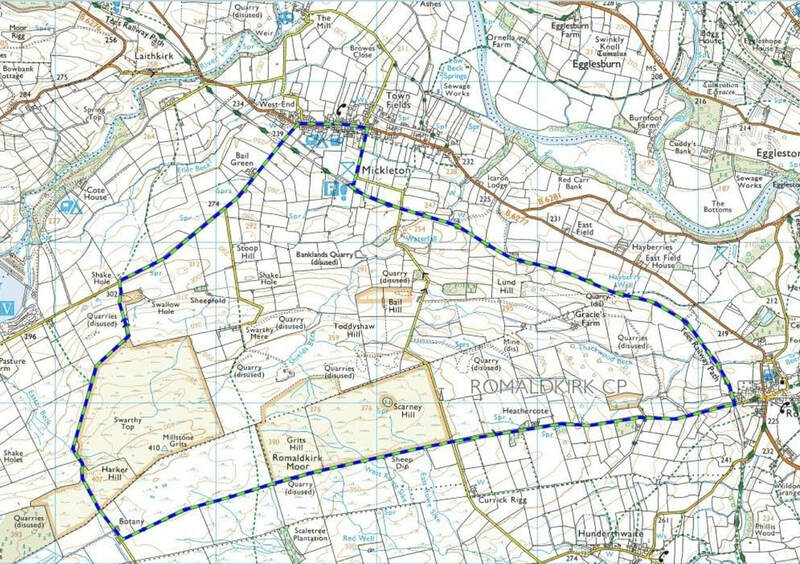 Directions : Starting from the site of Mickleton’s old railway station (signposted from B6277, free parking available) follow the route of the old railway east towards Romaldkirk. This is a level and reasonably well-maintained path affording good views across Teesdale. 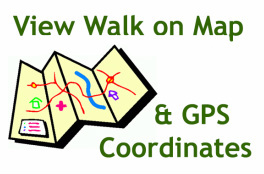 After approximately 1.75 miles you will reach Romaldkirk where you may wish to have a look around the village before continuing with the walk. Romaldkirk is a pretty village with many fine stone houses overlooking the village green. The church known as the Cathedral of the Dale is well worth a look. To continue the walk turn right from the point the railway path emerges onto Fell Lane and follow the lane steadily uphill for a mile until the crossroads with Bail Hill Lane. At the crossroads go straight across following the unmettled track (Botany Road) across Romaldkirk Moor. From here there are sweeping views down Teesdale and out towards Teesside and also across Baldersdale. Follow this track which rises steadily for a mile before reaching Botany Farm. Here turn right, pass the farm and go through the gate onto the small lane heading west towards Lunedale. Follow the lane towards Lunedale with far reaching views of Grassholme and Selset Reservoirs. After a further mile this small lane joins West Pasture Road.At this point turn right and follow the road for one mile back to Mickleton. Rejoin the railway path shortly before entering the village and walk the quarter of a mile back to the start of the walk.